German architecture André Broessel’s has created a futuristic looking device that could change the face of present day energy sources. Broessel’s stand-alone solar energy generator is not your typical solar panel. His invention, called Betaray, is more than just an eye pleasing sculpture. Brussels was a finalist in the World Technology Network Award 2013 with his magical looking orb that is purported to be 35 percent more efficient than the typical flat styled panel. Its efficiency can be increased even more when coupled with a special tool designed for tracking the sun. 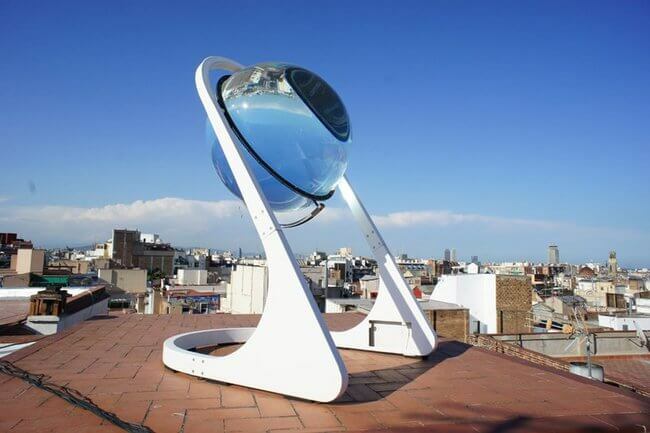 The premise is simple: The rotating glass sphere collects energy directly from the sun. This energy is then concentrated onto a smaller surface of miniature solar panels. The spherical shape of the lens enables it to “concentrate and diffuse” the light from the sun onto one isolated focal point. This make it more practice and efficient than traditional styled panels. The orb requires less material to create solar cells, and uses a less expensive material (Mainly crystalline silicon). The Betaray is also not affected by inclement weather because of its on-board weather tracking system.